There's great fruit in China and Taiwan. I am not so sure about Northern China like up around Beijing, but in Shanghai there was good fruit. China imports much of it's fruit from Taiwan. And Taiwan has fantastic fruit. There were these great fruit stands too where you could get a fresh juice made in front of you. Yum! It's very good. Korea's fruit is rather dull. You'll find stuff like apples, oranges, grapes and persimmons. Nothing too exotic. And in Japan I can't really say as my time there was relatively short, but I didn't see much of anything exciting when I was there. Anyways China and Taiwan is where it's at. Of course the rest of Southeast Asia will be good for fruit too. 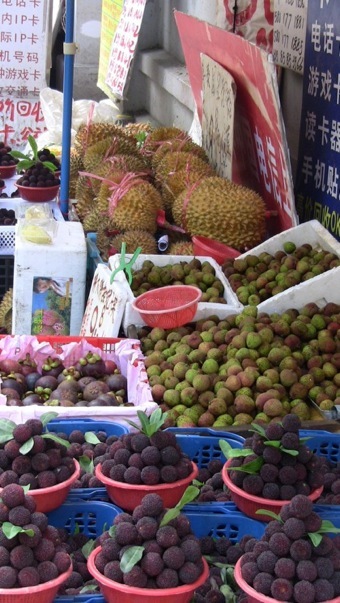 In Taiwan and China you'll find: durian, dragon fruit, mangoes, papaya, lychee, starfruit, wax apple, jujube, Buddha's head, guava, passion fruit, Asian pears, and all the other normal fruits you can imagine. A couple of other exotic fruits I ate in China were: mangosteen, rambutan, and yangmei! The spiky looking large fruit in the back of this picture is called durian. In front of that you'll see lychee. To the left of the lychee is mangosteen. And in the front is yangmei. This was one of my favorites. It's making my mouth water as I write. To me it tastes a little like a cross between a grapefruit and maybe a blackberry. So there is great fruit to be had in much of China and in Taiwan!